HomeEQUIPMENTHeidelberg Announces Changes on Its Board and Senior Management. Heidelberg Announces Changes on Its Board and Senior Management. 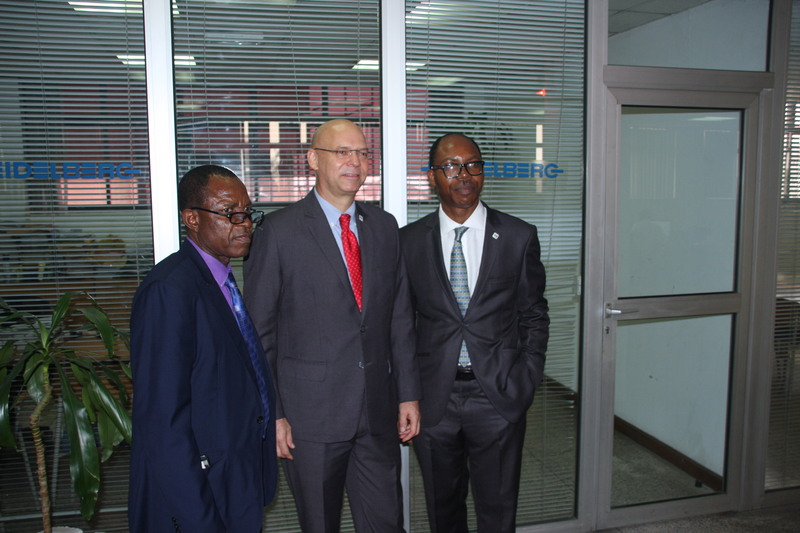 L-R: Mr. John Onuegbulem, Sales Manager New & Used Equipment; Mr. Jacob Bejer , Chairman; Mr. Godwin Ogilo, Managing Director. Heidelberg Nigeria Limited (HNL) in its bid to focus on growth and technological excellence, has reconstitute a new management team. Mr. Jacob Bejer has been appointed as the new Chairman of the Board after 16 years as Managing Director, while Mr. Godwin Ogilo the former Chief Finance Officer is now the New Managing Director effective from Saturday 1st July 2017. This was announced during a press briefing on Thursday 8th June 2017 at Heidelberg Lagos office. Other members of the reconstituted management team include Mr. John Onuegbulem, Sales Manager New & Used Equipment; Mr. Charles Ogbebor, Customer Service Manager; Mr. Adedayo Fakuade, Head Consumables; Mr. Kabiru Bilesanmi, Accounts Manager and Mr. John Agba as Head Admin/HR. In a related development, Mr. Oliver Jung has joined the Supervisory Board of Heidelberger Druckmaschinen AG, Heidelberg, Germany. He was appointed by the Mannhein registry court on Tuesday 23rd May, 2017 until this year’s general meeting of Heidelberger Druckmaschinen AG on Thursday 27th July 2017. At the meeting, the management will propose Mr. Jung to the shareholders for election to the Supervisory Board in a separate agenda items. Also, Heidelberger Druckmaschinen Aktiengesellschaft (Heidelberg) expanding its Industry 4.0 offering – takeover of software provider DOCUFY GmbH in Bamberg (www.docufy.de) as a step to strengthens the Digital Platforms division from 1st May, 2017. Bejer who was delighted to announce the new development expressed his optimism on the changes. “We’re convinced that this change would strengthen HNL, since Ogilo is extremely respected in the Graphic Industry and has over 18 years of detailed knowledge to the industry. I on the hand would be able to focus fully on supervisory functions, both in and outside Nigeria. As the Chairman, I will remain actively engaged with HNL, its partner and customers while supporting Ogilo in his new role as managing Director,” he stressed. Bejer however reiterates HNL’s commitment to serving its customer better as well as becoming a one-stop solution provider in the graphic, printing and packaging industry.